The task at hand appears overwhelming. To restore the common ownership of the land & natural resources has been a goal of reformers down the ages but it has often met with limited success. Faced with legal frameworks devised and defended by elite interests, the citizen has had little hope of seeing meaningful restitution or recompense … which makes this week’s blog so sweet. Tonight the representatives of Carluke Development Trust have been told that, after several years of investigation and tactical planning interspersed with long periods of waiting, a small parcel of ancient common land has been returned to the residents of their parish. It is a victory on an incredibly modest scale but it presents important lessons. 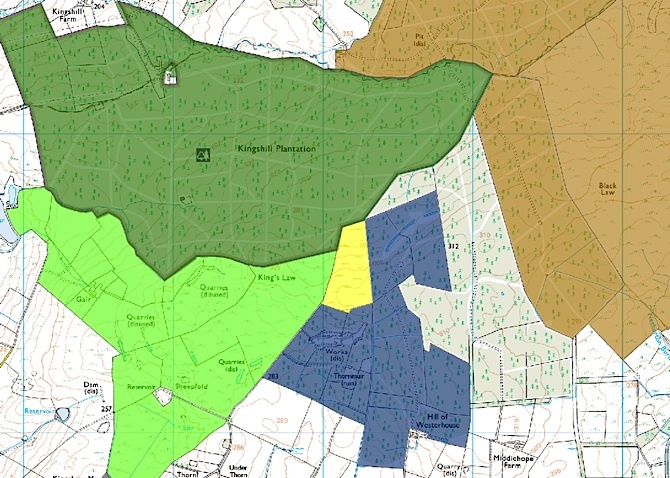 In 2005 I discovered a title to a neighbouring parcel of land (the dark blue in map below) which “a right of common grazing on the hill of commonty tinted yellow”. 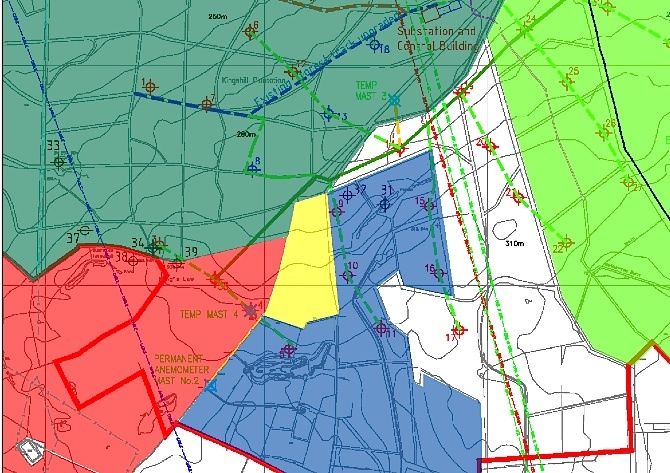 This was evidence that part of the “undivided common” referred to in the Statistical Account may still be common land although much reduced in extent (the yellow area is 33 acres compared to the 86 acres in the Statistical Account). What was even more interesting was that this parcel of land is in the middle of what was at the time the UK’s largest onshore wind-farm, Black Law, owned and operated by Scottish Power (see map below). 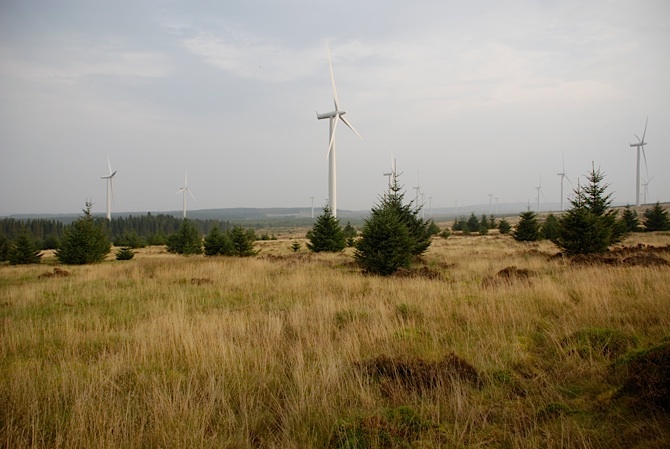 They knew all about the land and, having concluded it was a common, decided not to install any wind turbines on it because they didn’t know who could competently sign the lease. Thus a combination of local ignorance of the existence of the commonty and unclear legal status meant that the good folk of Carluke missed out on a potentially lucrative source of revenue. 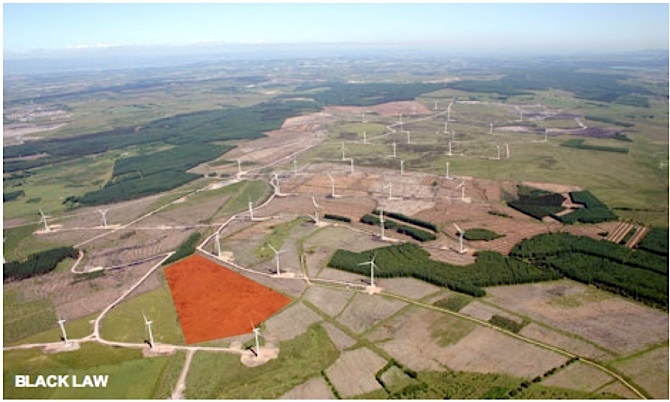 Image: Black Law Wind Farm showing how installations avoid the common. At this point things became quite sensitive and complex. To convince the Keeper to register the title, we had to show that nobody had a legitimate claim of ownership. The Crown, however, wanted us to eliminate the possibility that any of the potential ancestors of the owners identified in the 17th and 18th century could legitimately make a claim before they (the Crown) would be able to consider whether they in turn wished to do so. Suddenly we were now being asked do the precise opposite of what we had spent two years convincing the Keeper of (that no-one owned it) to now showing that someone did own it (but they did not wish to claim it) which, in turn opened the possibility of the Crown claiming it and selling it! This bizarre scenario was eventually resolved in a manner which it is not prudent to publicise. And so, last week, a title was granted by the Keeper to Carluke Development Trust. Which is, we think, a cause for some celebration. It does, however, raise some urgent questions. There are many more remnant commons across Scotland. One recent example I have been investigating concerns a 400 acre common in Perthshire that four landowners recently appropriated and split up among themselves without anyone in the parish knowing about it. It caused much resentment but nothing much can be done without spending considerable time and money (which nobody has) on a legal challenge. Another one in the Borders is on the verge of being grabbed by the owner of a large landed estate. Again, locals are nervous, unwilling to speak out in public and have limited funds to challenge. Many more such cases litter the Scottish countryside. This is why, during the Carluke investigations, as a new Land Registration Bill was being debated in the Scottish Parliament, I argued that commons should be afforded legal protection by means, in the first instance, of a “protective order”. This would “freeze” any claims until a proper and impartial investigation could be carried out into the legal history of the land and avoid any land grabbing. Unfortunately, Fergus Ewing appeared to take exception to this idea and, like other proposals I made, he admitted having spent “spent zero minutes and zero seconds studying the issue”. This was typical of the Scottish Government’s approach to the Bill which appeared to be solely focussed on the need and wishes of the legal profession, property professionals and the Keeper. 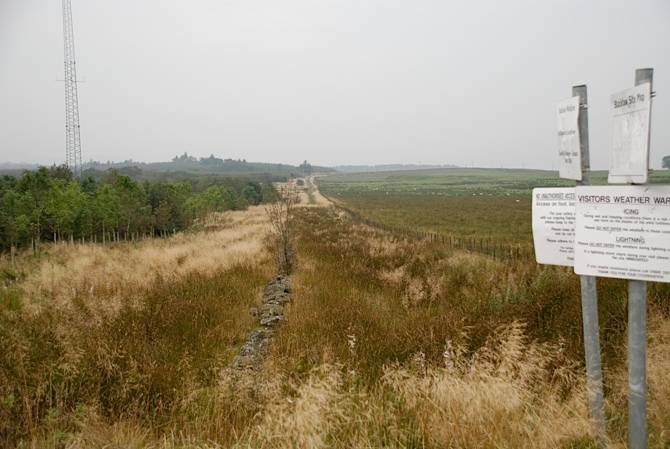 Even a modest proposal that the 1695 Act that allows commons to be divided be repealed (being an act passed by the landed class to appropriate common land) was rejected by Ministers on the grounds that “The Act allows an area of commonty to be divided among the owners either (1) where holding the land as Commonty no longer suits the parties or (2) to allow enclosure and cultivation of the land. In modern common ownership, a similar end may be achieved by an action of division or sale. It is not desirable to remove this right from the owners of Commonty”. This was stunning. A government in 21st century Scotland was defending a law devised in the 17th century to steal land. We were aware, of course, that in claiming the Black Law commonty, we were deploying exactly the same methods as the landed class. The difference, of course, was that we were doing so to pursue the goal of restitution rather than personal enrichment. Which is why, in addition to overcoming the complexities of making much a claim, providing a means to register protective orders, and repeal the 1695 act, we also need a land restitution act to recover land that was once held in common. Finally, this tale emphasises the fact that community ownership of land is not, as some would argue, a novel or new notion. It is a very old one in Scotland’s parishes and burghs. It it just that the landed class, their lawyer friends and successive Parliaments of property owners have conspired (through Acts such as the 1695 one which is apparently of such great importance today) to rob us of our collective inheritance. Which is why this 33 acre piece of moorland high in the Lanarkshire moorland may represent a small but significant turning point. PS We also submitted an application to register a title in the loan running up to the commonty (a loan is a public way that is itself common land). The Keeper rejected this claim on a legal technicality. Here is a photograph looking down the loan from the common. (1) This is the same commonty referred to in Chapter 22 of The Poor Had No Lawyers. Ian Adams’ research on Scottish commonties (Directory of Former Scottish Commonties) was published by Scottish Record Society in 1971. (2) I would like to share this report with you but like many others I have written, it belongs to my client, Carluke Development Trust and it contains details of our secret methods. (3) Bona vacantia is one of a number of Crown property rights that are devolved to Scottish Ministers. Time to bring the thieves to justice, not just of the commons, but of all the tenants improvements down the ages. How very heartening to see a positive result against all the establishment obfuscation and elitist thievery. A way has to be found to beat the SNP into shape and to take a positive view of reform. Beautifully done, but what a long hard road to have to take. It underlines the need for a much more all-encompassing change as well as the turgidity of the Scottish establishment, in which, unfortunately, one has to include the SNP. A momentous piece of work Andy. Well done! Previous Victory in Dumbarton – Posties Park saved! Frederick Douglass, and African American citizen, and a great friend of Abraham Lincoln’s said to the President: “For those who are concerned about being in the struggle, the only reward they may look forward to is TO STAY IN THE STRUGGLE”. Please heed these words! And know that we Americans who care are digesting the fact that 150 years ago, on April 14, 1865, one of our most astute and capable presidents was shot to death while attending a theater production, by an actor named John Wilkes Booth.